There’s no doubt that sport is an important part of our school life at Sompting Abbotts. The emphasis is on fun and teamwork – and not winning and losing. The sports programme is inclusive and varied and encourages both teamwork and individual skills. Our pupils start young and benefit from excellent and varied sports facilities. it’s not long before the Prep School children are competing against other local prep and primary schools. Alongside all the sports you would expect such as rugby, football, cricket, netball, tennis and gymnastics, there are a few you might not. These include golf, squash, modern dance, archery, fencing, orienteering, mountain biking and shooting. We try to inspire our pupils to find a sporting activity they love. Sport is played in formal lessons in Main School at least three times a week and taught by specialist teachers. Children in the Pre-Prep are taught two lessons per week of sport and will also receive a variety of sporting tuition. 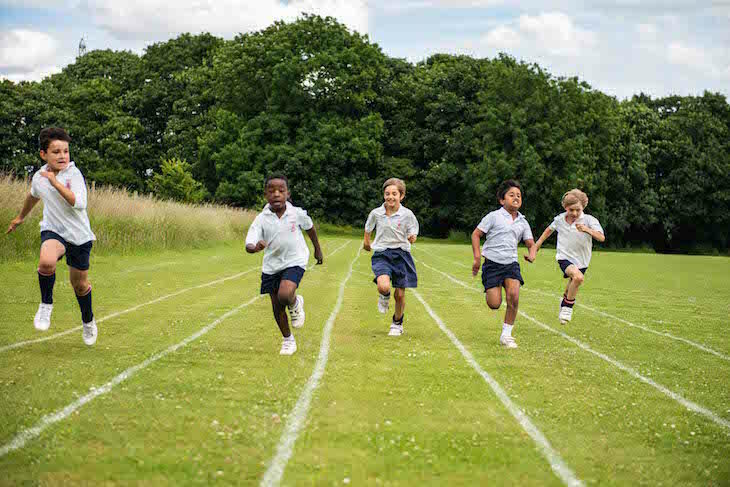 In PE lessons, children are taught co-ordination skills in gymnastics, cross-country, swimming and athletics. Gymnastics is taught in the school gym. Children focus on creating sequences to perform in front of the group. They will work alone, with partners and in small groups displaying a wide range of body shapes and actions using the floor and gym apparatus. In games lessons, the major team sports are coached: netball, rounders, football, rugby and cricket. PE includes games activities which develop leadership, cooperation, self esteem, creativity and a sense of fair play. We feel it's important for all children to be able to swim and are fortunate to have our own on-site heated swimming pool. The Swimming syllabus is primarily taught in the Summer term, along with Athletics and is directed towards developing stroke technique. The children are introduced to personal survival and life-saving skills. In the Summer term, the houses compete in a Swimming Gala, at which parents are also invited to spectate. Athletics is taught in the Summer Term in preparation for Sports Day. These include a wide range of track and field events which are located in our superb grounds. These include Long Jump, High Jump, Relay and others. Sports Day is a great sporting and social occasion and all families of students look forward to attending. Our school has a busy fixtures programme with other independent and state schools and it has earned an excellent reputation for sporting success. There are many opportunities for pupils to play in competitive inter-school and house matches. The boys’ main team sports are football, rugby and cricket, while the main girls’ team sports are netball, rounders and tennis. We do cross-country, athletics, tennis and swimming fixtures too. Most of our fixtures are against Sussex and Surrey prep schools and take place during the week in the late afternoon. We publish all fixtures well in advance in our termly calendar and parents are very welcome and encouraged to come and support! Watch a Syncronised Swimming Lesson at Sompting Abbotts Preparatory School in Worthing, West Sussex. The school uses its heated outdoor swimming pool during the warmer months for lessons and fun and parents are free to use it during the summer holidays. A quick glimpse at Sompting Abbotts Sports Day for the Pre-Prep (Reception to Year 2). Parents get to fun-race too and a sandwich tea is served for everybody on the school terrace afterwards.